DEXTER Fans Can Now Test Their Series Knowledge And Play Weekly Games On Facebook With "Dexter's Disciples"
NEW YORK, NY – October 1, 2012 – With the premiere of the seventh season of its No. 1 rated series DEXTER, Showtime Networks has launched two new digital initiatives to give the series' fans even more access to their favorite show. Last night, the network unveiled the first-ever, official DEXTER podcast, providing a behind-the-scenes look at the making-of the Emmy® and Golden-Globe® nominated series, and featuring interviews with the creative minds and stars of DEXTER. In addition, the new interactive Facebook trivia game "Dexter's Disciples" will give fans the chance to compete in an overall season-long game, as well as play four weekly mini-games after each episode. "DEXTER Wrap-Up" will offer new podcasts every Sunday night after each new episode airs at 9 p.m. ET/PT on Showtime. Scott Reynolds, one of the series producers, will serve as the host, as he interviews members of DEXTER's cast and crew. This season, the podcast will include interviews with series stars Jennifer Carpenter, Desmond Harrington, C.S. Lee, Lauren Velez, David Zayas and James Remar, special guest stars Ray Stevenson and Yvonne Strahovski, and series executive producers Manny Coto and Wendy West. Series executive producer Scott Buck will also answer fan questions submitted weekly via the series' Facebook (facebook.com/Dexter) and Twitter (twitter.com/SHO_Dexter) pages. The first podcast, featuring series star Jennifer Carpenter, can be downloaded now for free on iTunes®: http://s.sho.com/V6VRYx. The weekly social game "Dexter's Disciples" features DEXTER trivia on Facebook (apps.facebook.com/dextersdisciples), and is fully integrated within the existing DEXTER iPhone®, iPad® (http://s.sho.com/So6LbK), and Android (http://s.sho.com/V1Xo23) apps. The mini-games will test viewers' show knowledge including trivia from past seasons and predictions for upcoming episodes. Just like Dexter Morgan collects blood slides for all of his victims, so will the players of this game, as they earn blood slides by correctly completing each weekly mini-game. Fans will also be able to invite friends to play, unlock special content, and compete to be the ultimate "Dexter Disciple." 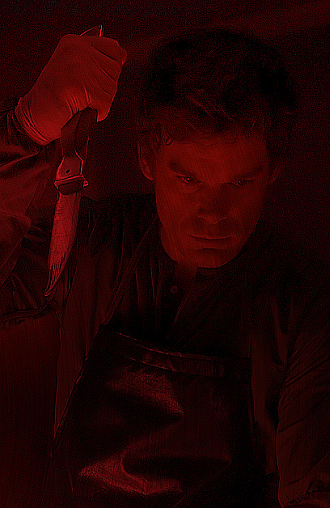 With one of the most active communities of any cable series, the DEXTER Facebook page boasts over 12.5 million fans.